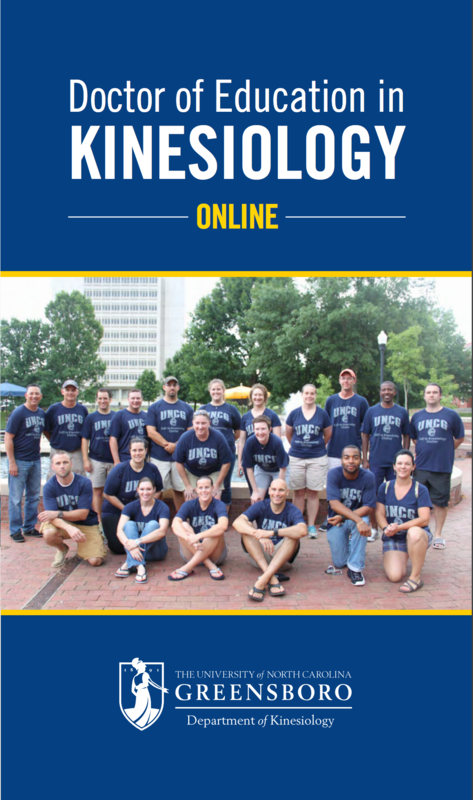 The Doctor of Education in Kinesiology Online (EdD in KIN Online) at UNCG is an interdisciplinary, professional degree program specifically designed for practicing professionals who have a minimum of three years of professional experience in Kinesiology or related fields, and desire a doctorate that is focused on professional scholarship and practice in leadership, advocacy, and teaching. Our aim is to bring together a community of scholars to develop action-oriented leaders. The four-year online degree program is cohort-based and requires students to complete of 54 credit hours including the dissertation. Students will address current professional practice issues in the field from an applied, interdisciplinary perspective. Professional Learning Communities will support student academic and professional growth throughout the degree program. All coursework will be completed online. Three required on-campus summer visits foster collaboration and community and fulfill residency requirements (Orientation Pre-Year 1, Oral Comprehensive Exam and Dissertation Proposal Year 3, Dissertation Defense Year 4). Summer 2019 Orientation dates: June 10-12, 2019. Faculty recognized as innovative teachers and accomplished scholars at local, national and international levels by professional organizations including ACSM, AERA, AKA, AASP, ISSP, NAK, NATA, NASPSPA, SHAPE/AAHPERD, TASSP, and WCAA. Please see this Visual Overview of how to complete the Doctor of Education in Kinesiology Online (PDF) in 4 years (Sample Coursework shown). For more information please contact the Program Director, Dr. Pam Brown, at eddkin@uncg.edu. Here is what our students have to say about the program! I have enjoyed the program immensely. To describe the KIN EdD program in one word, it is “applicable.” The lessons I’ve learned in the courses at UNCG were directly applied to my work as a professor in kinesiology-based courses. The program has helped me gain a better understanding of various university processes, such as hiring faculty, developing content, and creating new courses. While picking the program was an easy choice as it is one of the few online Kinesiology courses with such a stellar foundation, I’ve found that the program itself has exceeded my expectations. The faculty members are all incredible and the format of the program allows me to work full-time, care for our young children, and earn an Ed.D. from a nationally recognized program. It literally is allowing me to change the direction of my career and life.